The first two photos show my new draft snakes, instructions for which can be found in Lotta Jansdotter's Simple Sewing. The first one is in a living room window, and the snake stops what was a very cold draft and has the added feature of holding up Xmas cards. 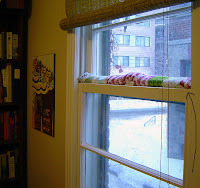 The second one is in my office, where there was also a cold draft coming in between the windows. These are just tubes of fabric filled with rice, and they really work! The third photo shows Mooky's newest blanket, on a chair in Bill's office. Does it seem like I make Mooky a lot of blankets? That's because it's cuter to say they are blankies for the cat than to say they are protecting the furniture from the cat. I just sewed some strips of fabric together, and the other side is one solid piece; there's no batting between them. I sewed them together (wrong sides together) and zipped back and forth across the middle a couple of times to hold the two layers together, and then pinked the edges. (I love pink as a verb.) Easy peasy. Not only will it keep the cat hair off the chair, but now we won't have to turn on the light just to see if Mooky's sleeping on that black chair. I had a nice Christmas day -- opening lots of prezzies, because I'm very lucky; talking on the phone to family; going to a matinee of Juno and then back home to stuff and roast a little chicken; eating like there was no tomorrow; slipping happily into a gravy-and-pie coma while watching The Sound of Music on TV. Perfect. Christmas is awesome. Hope you had a merry xmas- and hope to see you soon! How is flannelette different from flannel?? I'm glad that you had a good holiday. The little draft snakes are cute. In the area I'm in though more people cover their windows with plastic to prevent the drafts. You really mean you were protecting the furniture from Mooky's black fur. Sometimes it is the best thing to do. Mimi likes to roll in dirt so her favorite spot on the family room couch is covered with a white towel. Well, it is white right after being washed. I am sure that you have the same problem with Mooky. Glad you had a great Christmas. Thanks for pillow case tutorial. I like simple (hopefully) but useful and fun gifts to make. Do you have a favorite online fabric store? Thanks for sharing your knitting year and all the best in the New Year. Do you know that we have paralell sewing lives? Over the past month I made triangular catnip toys and an indentical draft snake (though I was calling it a Draft Dodger- ha!) and then I'd look at your blog and you'd done the same. It's a little weird.